Garcia has been one of the best players for nearly two decades and a Major was all that was missing. Now he has that, I expect him to kick on. Sergio proved over four days that his long game is the equal of Rory McIlroy and Dustin Johnson. He now knows he has what it takes to beat them over four days in the biggest events. For me there were three factors that had stopped him getting over the line before last Sunday. No-one suffered more at the hands of Tiger Woods, and was affected by his dominance in quite the same way, as Sergio. He then started struggling badly on the greens and he didn’t have the fulfilment he needed in his life off the course. Tiger is no longer a factor, the Spaniard has found a putting method that works for him and he’s found happiness with fiancée, Angela Akins. Sergio is only 37. This should be the springboard to more Major wins because he is a stellar player. If anything, The Masters was the place where he was least likely to break his duck, as normally the best putter triumphs there. What worked in his favour this year was the fact that conditions were so tough on the first two days. That meant the emphasis was on accuracy and that allowed Sergio to get into position. You look at the rest of the year, and all the other Majors play to his strength of brilliance from tee to green. That is especially the case with The Open at Royal Birkdale. Sergio won’t rest until he has a Claret Jug in his hands. If anyone has the ideal game for seaside golf, it’s him. The Open slipped from his grasp at Carnoustie in 2007, and I’m sure that’s still on his mind. The British public has always had a soft spot for him and there would be few more popular Open Champions. But if Sergio will be targeting success at Birkdale, it’s exactly the same for the man he beat in the play-off at Augusta, Justin Rose. Justin may have narrowly lost out on the Green Jacket, but his reputation was only enhanced – on and off the course. He has a lovely technique and a steely determination about his game, and he is desperate to win another Major. 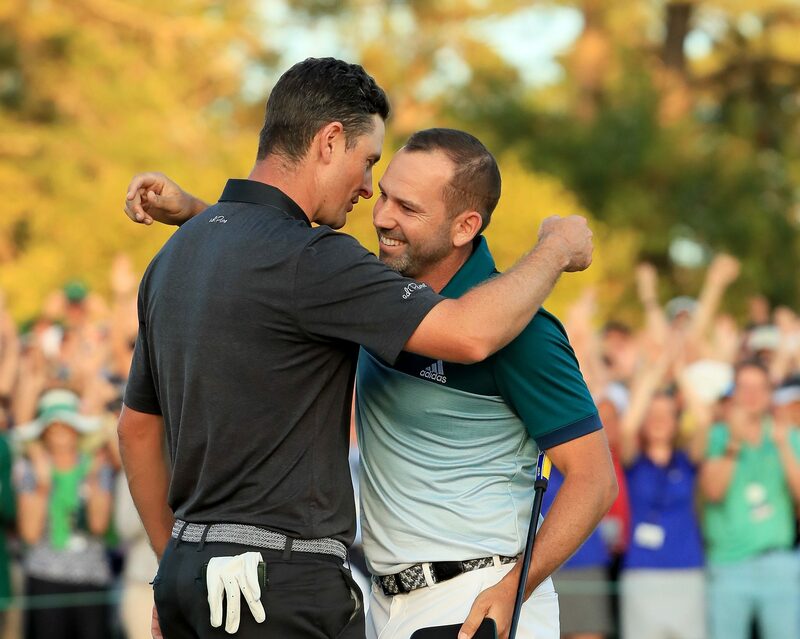 What’s more, the sportsmanship that was on display between him and Sergio in the heat of battle was heart-warming and a superb advert for golf. Of course Justin will be disappointed. He’ll reflect on the 13th when he could have gone three or four shots clear. But he missed his birdie putt and Sergio made that fighting par. I don’t think that was down to pressure. They were Augusta errors. And I’m sure there will be no baggage moving forward. Going to Birkdale will bring back great memories for Justin from when he finished fourth as a 17-year-old amateur in 1998. In that time, he’s gone from a boy to a golfer of real stature. Last Sunday was a very special moment for European golf. The sight of Danny Willett putting the jacket on Sergio reminded me of when Sandy Lyle did the same for Sir Nick Faldo all those years ago. That was the start of an incredible run of success for Europeans and I have high hopes for something similar nearly 30 years on. Last Sunday was everything we wanted – and more – from The Masters. It really is the most wonderful TV spectacle. It has set up the rest of the golfing year in the grandest style possible. And the best news of all – the Europeans are on the charge.